Global demand for electric transmission and distribution (T&D) equipment will rise 6.7 percent annually to $177 billion in 2017. The Asia/Pacific region, led by China, will continue to post the fastest gains. In North America and Western Europe, advances will be driven by the increasing proliferation of renewable energy projects. 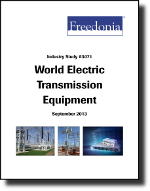 This study analyzes the $127 billion world electric T&D equipment industry. It presents historical demand data for 2002, 2007 and 2012, and forecasts for 2017 and 2022 by market (electric utilities; industrial and nonutility generators; commercial, government and residential), product (e.g., power transformers, distribution transformers, switchgear and switchboard apparatus), world region and for 20 countries. The study also considers market environment factors, details industry structure, evaluates company market share and profiles 29 industry players, including ABB, Schneider Electric and Siemens.